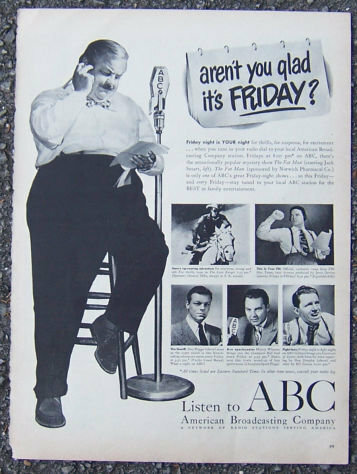 1940s ABC Radio Friday Night Shows Magazine Advertisement. Aren't You Glad it's Friday. Ad features Jack Smart as the Fat Man, Lone Ranger, This is Your FBI, The Sheriff, Champion Roll Call, and Fight Night. Ad is 13 1/2" high and 10 1/2" across. Very good condition. Suitable for framing.